June is considered to be the best time to visit Norway thanks to it’s extra long days giving you more time to explore this beautiful country. Norway is split into a number of regions in which all have their own unique characteristics to offer. The Northern Region is one of the most northern points on the planet and during June you can experience something quite special – ‘The Midnight Sun’ pretty self explanatory this occurs thanks to aforementioned the extra long days meaning the sun is still out come midnight. Northern Norways also is one of the best places to marvel at the magical northern lights a once in a lifetime opportunity that you simply cannot miss – and what better way to see them than on a Hurtigruten Cruise, as you cruise through the calm cold waters of the Arctic. It is also home to the stunning Lofoten Islands with dramatic scenery everywhere you look the Lofoten Islands are like no where else in the world, set above the Arctic Circle they possess crystal clear water, granite mountains and idyllic fishing villages teamed up with sandy beaches it really is the hidden gem of the Northern Hemisphere. Oslo, Norways capital city offers an alternative from the surrounding natural beauty with a quirky urban experience like no other in the world. Take in the culture of the city with a number of famous museums and galleries for you to visit such as the National Gallery, the International Museum of Children’s Art, and the Vigeland Sculpture Park. It’s also recently developed a big dining scene for you to sink your teeth into – as well as shopping and music throughout the city you will be sure to kept busy in this lively northern hub. The Fjord region is an area in which draws a lot of attention thanks to its world famous Fjords and waterfalls along with this natural beauty it is home to Bergen, Norway’s second largest city. There are a number of ways to experience the Fjords but for us to best way to get the best experience of them is on a Hurtigruten Cruise. During the month of June you can catch The Bergen International Festival which is Scandinavia’s largest performing arts festival. Central Norway is also worth a visit, driving the Atlantic Road offers incredible views of the ocean and surrounding areas and on the way you will come across quaint fishing villages all with the freshest seafood especially the salmon in which this area has become famous for. Trondheim is a gothic city which has its own special feel about it, home to the UNESCO site Roros and the Nidaros Cathedral. The Southern Region is made up of a number of picturesque islands with old fashioned wooden towns known as Norway’s Riviera.The area offers hiking, cycling, swimming, sailing, climbing, and skiing. These areas have a real vikings feel about them as you will explore a number of laid back fishing villages. 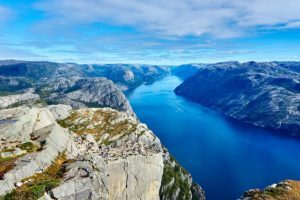 Eastern Norway has a number of national parks in which you can go on a selection of hikes through forrests and surrounding lakes which will be sure to have a number of stunning views. If you have any further questions on any of the above don’t hesitate to contact us. Heading to Russia in June has a number of advantages over the rest of the year, this is down to it’s long days providing sunshine until the early hours of the morning a quite strange phenomenon which is well worth experiencing. 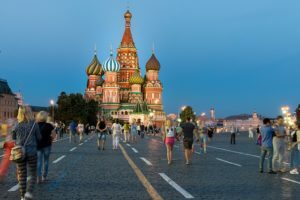 Holidays to Russia are becoming increasingly popular which cities steeped in history and some truly beautiful scenery to be explored and admired. It’s fair to say that Moscow and St Petersburg top the list of most visited tourist destinations in Russia. St Petersburg, the former capital and Moscow, the current capital have much to offer visitors from not only within Russia but from around the world. Tourism in the country is developing at a rapid rate and one of the most popular ways to see the highlights is via Russia escorted tours which will help you get to many of the areas of interest under the safe guidance of experts familiar with each region visited. Moscow Escorted Tours – To get the most from this dramatic city, it might be easier as part of an escorted tour. There is so much to see and do, you could easily spend a few days getting around it all. Red Square might be your starting point, given that it is very central in the city and from here you might enjoy and explore sights such as the Kremlin and St Basil’s Cathedral as well as famous places like Gorky Park, the Bolshoi theatre and the Moscow Metro too. Saint Petersburg – Further North than Moscow lies the old capital of St Petersburg, which is once again packed with interesting places to see. The State Hermitage Museum and Winter Palace are particular highlights along with Catherine Palace, Peterhof Palace and the Mariinsky Theatre where you can sample some ballet or an opera. Russia River Cruises – Taking a cruise on Russia’s rivers is becoming more and popular every year. With many companies employing cruising vessels that are essentially luxury hotels on water, it’s a great way to get a completely different view of some of the countries dramatic cityscapes and countryside. With rivers and canals connecting large swathes of the inland, it’s possible to cruise from Moscow to St Petersburg whilst enjoying the leisurely pace aboard your luxury cruise ship. Cruises on the River Volga are also especially popular. Trans Siberian Railway – If you prefer not to travel by water, why not experience the wonder that is the Trans-Siberian railway, which can not only take you, via rail network across large chunks of Russia, but if you so wish on to China as well. It’s the longest railway in the world and it’s a trip that will live long in the memory. With so many ways of seeing Russia, it’s never been easier to visit and explore some of the most beautiful places on earth. For much more information about any of our escorted tours to Russia, please feel free to contact us. 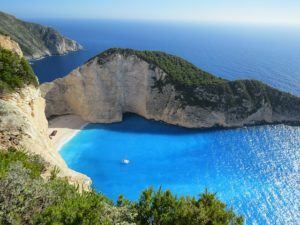 Now compared to Norway and Russia you can expect a whole new experience in Greece during the month of June. You get the best weather without the crowds and inflated travel costs as summer officially starts but peak seasons in Greece are July and August. Now Greece is a country that possesses some qualities in which make it possibly the perfect holiday destination with its beaches, crystal clear waters, ancient history, delicious food and a vibrant culture to keep you in high spirits. If it is a beach holiday your after then there’s endless possibilities in Greece as some of the very best resorts Europe has to offer. With a number islands all possessing spectacular beaches we work closely with some of the best tour operators and with a number of Club Med and Mark Warner resorts we can arrange you a holiday you won’t forget! Greek history is also worth exploring with the ancient ruins of Sparta scattered throughout the country and a spot of history at every corner. Athens is the main hub of this incredible history being the central city to the Greeks powerful empire and home to some of the most important buildings in Greek history. Acropolis is possibly the most recognisable, sat at the top of a hill overlooking the city this 5th century temple is a must visit as it also provides great views of the surrounding city. Head to what is said to be one of the most important temples of all time being the Parthenon and its world famous columns towering over the ancient ruins that have been untouched for thousands of years. Now onto the main pull for tourists to Greece its islands, with over 200 islands all together each possessing their own characteristics in which attract people from far and wide to experience their stunning beaches and breathtaking scenery. Santorini possibly the most iconic of the islands with it’s rugged landscape formed by a volcanic eruption 16th century BC. Two of the main villages to stay at in Santorini are set on the cliff side offering incredible views of the coastline and beyond. This island offers crystal clear waters with long volcanic beaches and some of the best sunsets on the planet, making Santorini the picture perfect destination. Grab some of the freshest seafood dishes at one one of the many tavernas overlooking the stunning coastline while sipping on a cold glass of wine. Mykonos, famous for its vibrant nightlife and beautiful beaches attracts a huge number of different tourists each year all with different things in mind when it comes to their ideal Greek experience. If it is a big night out your after then this is the place for you with a number of beach side bars attracting famous DJs to come and create a vibrant atmosphere, teamed up with a series of amazing resorts contact one of our team to start your Mykonos holiday today. Corfu is another of the countries more popular of the Ionian islands and it is easy to see why. Home to rugged mountains and a coastline full of stunning resorts for you to stay at. Corfu is widely recognised as a luxury holiday resort you have a wide range of amazing resorts to pick from set on this beautiful island. Along side these resorts are some of the very best beaches in Europe, an endless list of beaches occupy the island all as beautiful as each other with hidden coves and caves for you to explore. Contact one of our team to start your Corfu holiday or click here for tours and resorts.